Remember last fall when I shared a sneak peak of my fiber birdhouse? The time for the final unveiling has come. 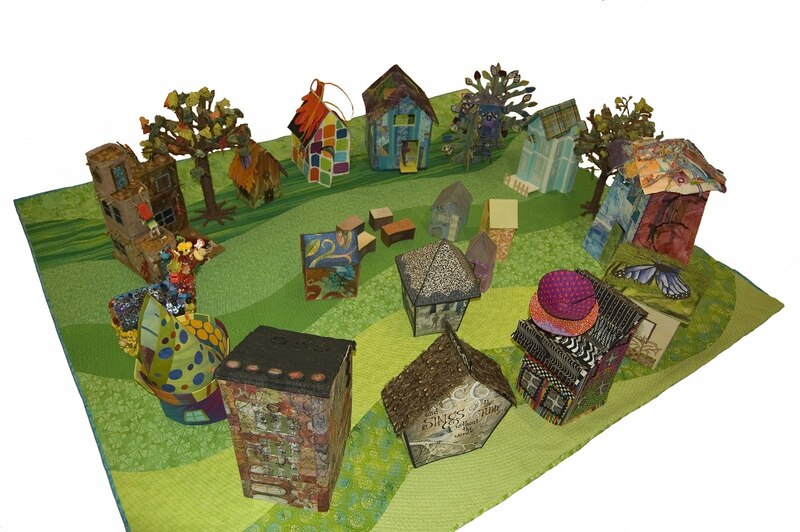 I agreed to make a three dimensional quilted house to be part of the Artist Village Project organized by Kathy York. Kathy was inspired by the fabulous fiber houses painted and constructed by Judy Coates Perez. I'd also admired them and thought about making a house in my own style, so the challenge to do so as part of a group exhibition was too tempting to resist. I, of course, was deep into Bird Journal pages, so my house became a birdhouse version of a journal page. The entire exhibit is shown here displayed around the village green, a large green quilt offered by Kathy York as the perfect backdrop to showcase the houses. Along with the revelation of the group display, today marks the beginning of a blog hop to see the details of construction for each of the projects (not all of the artists have blogs, however). Here is the list of participating artists with links and the day their own fiber house will be featured. Check back here for a step-by-step layout of the construction of my birdhouse on May 13. I've seen this on a couple of blogs. It looks like a really good project, and very creative way to involve a lot of artists. Congratulations for being a part of it. Can't wait to see which one is yours! Enchanting little village! I see yours.